I am inclined to write a little about my shoes today but there’s a small difficulty. The way I write these weekly posts there is often the appearance of openness and candour and that is correct… to a certain extent. As with most people there are levels of information that I do not necessarily wish to impart, places where I do not wish to go. If I am to write a little about my shoes, I fear that line must be crossed. I don’t think I can write about my shoes without revealing a little too much about myself. Regardless of this, when the urge to write arises, it must be obeyed so here goes nothing. I only ever own one pair of shoes. If there’s a posh occasion, I polish them up to a gleam. On the other hand, if a field is wet and muddy, my shoes must suffer those consequences too. When my pair of shoes are done, I buy a new, identical, pair and I leave the old ones behind me in the bin. I’ve worn the exact same style of shoe for about the last thirty years. 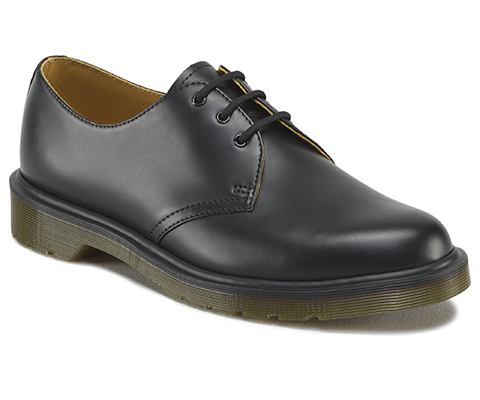 Dr. Marten 1461 PW Smooth in Black. Since roughly the end of November 2016, I have had a hole in my right shoe. The type of shoes I wear are not repairable by a cobbler so a hole is a hole. As I write this, at the close of January 2017, I am still wearing those shoes – the pair with the hole in them. I deal with my leaking shoe in a number of ways. Firstly, I always carry a spare sock in my coat pocket. If my foot gets wet while walking into work, I take the shoe off and replace the wet sock. By the time it’s time to go home, the shoe is relatively dry again. I have also developed a curious wet weather gait wherein I keep the inside of my right foot slightly elevated as I walk to keep the hole off the pavement and minimise the water ingress. I’m certainly not rich but neither am I so substantially hard-pressed that I cannot afford to walk in to the shoe shop tomorrow and buy my next pair of shoes. So why, then, have I been walking around for two months with a hole in my shoe? Am I a wretched twisted skinflint? Well, no, I don’t think so. It’s not as simple as that. It’s a bit like this. If anybody needs anything, they get it. That’s the way it is in my family. Mostly, even if somebody just wants something a lot, they get that too. I just tend to put myself last-in-line a lot of the time. It’s my natural inclination. If I really need something, I’ll get it, just like everybody else around here… just not necessarily today or tomorrow. There are always more important things to do than to go and get myself things that I may need. These current pair of shoes. They didn’t last long enough. I usually get a year out of a pair, these ones hardly lasted six months. I think I have developed a new habit of sitting in work with my toes bent over on the floor. It puts more pressure on the soles and the uppers and, as a result, the shoes have failed more quickly. It’s a bummer, I’ll have to try to stop doing it, I guess. So I need a pair of new shoes but I’ve just been holding out a bit. It hasn’t been all that wet and the spare sock works pretty well. That’s my way. If my wife or either of my sons needed new shoes, their feet wouldn’t touch the ground until they had them. Make no mistake about that. I think I’ve simply become accustomed to not taking too much of anything, of living quietly. I tend to eat the last dusty contents of the Cornflakes box. I don’t make dinner if I’m ever here by myself. The computer I’m writing on now is over ten years old. I seem to have come to feel a responsibility to not ever have any more than my share and less if I can get away with that. I have come to feel that it’s okay that I’m not number one in any particular equation. That there is a good grace in living quietly and not making too large an imprint anywhere. Sometimes I feel this is a kind of resignation. Once, I remember, I felt I might one day make a crater-sized impression on something or other. Now I don’t. Maybe we just modify our desires as we get older and learn more. There are still things that I want and I hope for and sometimes I get some of those. At those moments, I feel somewhat undeserving, almost as if some kind of cosmic error might have been made. I had quite enough before, I think, I didn’t really need this new thing no matter how much I might have wanted it. I wanted to write about this in particular today because it strikes me that this odd self-effacing tendency of mine is in total contrast to a certain world leader who now dominates our collective consciousness with his ruthless businessman approach to humanity. He already has a lot and he wants more… and more and more. Today, I feel like I am his diametric opposite in the world. Perhaps, in the nature of superhero comic everywhere, I am therefore one of those people best equipped to oppose him. It’s a thought worth considering. Although perhaps I’d better get some new shoes first. How about this? You buy that new pair you need, but keep the pair you've already got. You can keep using the older pair on days when it's not raining and you don't need to be smart. Eventually when you do retire the older pair, buy a new pair. Rinse and repeat. I do understand totally about not putting yourself first. If Carrie needs something she gets it (and she usually does get it without batting an eye or feeling the slightest bit guilty) but I make do. There’re lots of things I’d like but over the years I’ve learned that things don’t really make me happy. This laptop doesn’t make me happy but what it enables me to do does. It’s a tool and nothing more but it’s a tool I can’t do without. (Well, I could but I wouldn’t want to.) When I was having problems with my Samsung at the end of last year Carrie bought me a reconditioned HP to work on while I restored the other. So now I have two working laptops, a 12" tablet and a desktop PC which is probably older than yours but it still works but I still doubt I’ll buy another pair of trainers this year. As I said Carrie bought me this HP. She also bought me the Samsung and the tablet (also a Samsung) and the tablet before that and the desktop is her old one. I’m not actually sure when I bought my last computer. I think she realises that it’s easier for me if I think of these as presents rather than something I wasted money on. I do not like wasting money. I really don’t understand fashion. I have never been in fashion. I’m rather glad I’m the age I am because I can dress to be invisible and no one cares what my labels say. Not that they say anything exciting. It does probably come down to self-worth. Am I not worth a new laptop or a new pair of trainers? Yes and no. I do believe I have worth but I think people get confused with buying stuff. The things you own aren’t a good measure of who you are. If you stopped wearing Doc Martens I wouldn’t think any less of you. That’s not what it’s about. And don’t get me started on Trump. For your information the euphemism my parents used for breaking wind was “trumping”. Just saying. I appear to be the only one thinking, if I bought a pair of DMs and they only lasted 6 months, I'd be asking for a replacement pair!?! My DM shoes (I wear these more often than any other pair of shoes I own) I bought when I was 22 years old. I'm 42. They are battered looking, but don't have any leaks in. I suspect if I bought a pair of DMs these days they would not be made to the same standard or durability. I think this is a shame, I'd like to trust a brand of shoes to actually be quality. I'm not sure that's possible these days. Claire: I felt the same when they failed. For the cost of them, they should do better than six months. As I said in the thing, my new habit of sitting with my feet pointed and my toes bent over would test the mettle of any shoe. You are right, though, and I agree. As I began reading I thought, "Yep, Ken has that 'southern girl' gene which makes it mandatory to put others first." I swear it's in our DNA. :) But for the record, I do tend to shop like a guy: know what I want, go into store, pick up, purchase and leave in as little time as possible. Your sharing put a smile on my face today. I'd backed away from news feeds as I couldn't stomach any more of our newly elected Dictator's mandates. (No, I didn't help him onto his throne). And there you were,reminding me that I know more WONDERFUL people than orange haired know-it-all's-who-actually-know-little. Thanks friend.